under the raedar: Divided Cities? There has been a lot of talk recently about the links between deprivation and the recent riots in England (e.g. this from the Guardian), and since I'm interested in the issue I thought I would do some very basic analysis to look at the spatial divisions of deprivation in English cities. 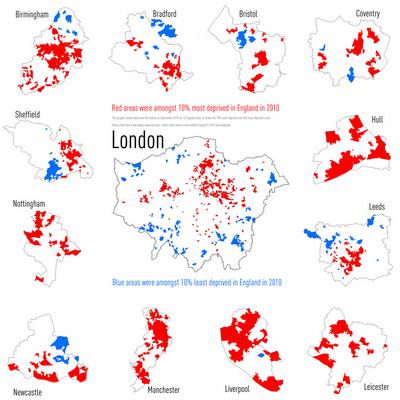 To do this I took London, the eight core cities plus Bradford, Coventry, Hull and Leicester and mapped the 10% most (in red) and 10% least (in blue) deprived (IMD 2010) areas on one large map graphic. The results are shown below - click the image to enlarge. Some interesting comparisons can be made from this image. In Hull, Leicester, Manchester and Nottingham there are no areas amongst England's 10% most deprived and in Liverpool there is only one. In Sheffield there is a clear NE/SW split in terms of the location of the most and least deprived and in Manchester, Birmingham and Liverpool the number of areas in the most deprived 10% is quite high. Not much else to say now except that I think in studies of deprivation we should perhaps be more concerned with inequalities and how they manifest themselves spatially.